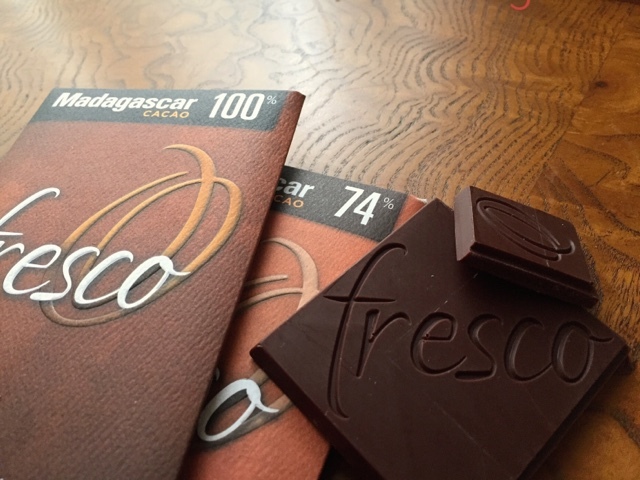 Fresco Chocolate Madagascar in 100% and 74% . Comparison for class preparation. The chocolate tasting adventure never ends. It seems most places I travel, people I talk to, and things I photograph are related to chocolate. Recently I've been asking people what their questions are regarding fine chocolate or tasting chocolate. The feedback has been wonderful and sparked a new direction for my chocolate adventures. I'm launching a new series of workshops, tastings, and videos related to those questions that people ask most. I'm designing a few new chocolate tasting tools too (a chocolate geek like me needs chocolate tools). How do you find "good" 100% chocolate? Questions like this inspired a chocolate tasting class. Chocolat Vitale is hosting, I'm leading the tasting. We will be comparing 100% chocolate to 72% - 74% chocolate made with the same cacao by award winning chocolate maker Fresco Chocolate. Taste the difference. So, tell me your thoughts? What are your chocolate questions? You might be the next inspiration. Join me on a journey to find fine chocolate.